Swiss National Day in Switzerland always falls on August 1st each year and celebrates the day that the three forest cantons of Uri, Schwyz, and Unterwalden signed the Federal charter near lake Lucerne back in 1291. People will gather at Rutli field where the Federal Charter was actually signed back in 1291 and enjoy barbeques, firework, parades and bonfires. Some families will have breakfast at a farm to help the kids know what is involved in running a farm and how hard it can be. In 1291 on the first day of August the three forest cantons Uri, Schwyz, and Unterwalden signed the Federal Charter on Rutli field, which is near lake Lucerne uniting the 3 cantons against the Habsburg rule at time. This signing is now considered the founding of Switzerland today. 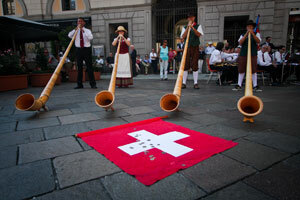 Provides the dates for holidays for the calendar year for Switzerland.